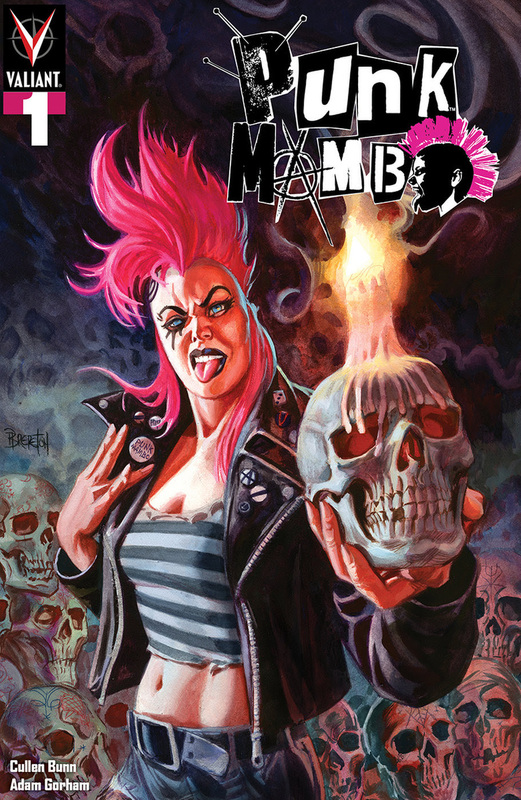 From the depths of the bayou to New Orleans and beyond, “Punk Mambo” is a world that is full of mystery and magic, with a punk rock attitude and a great story. It grips you from the very first panel, and never lets up. It’s dark and twisted, with a great sense of humor. And having never read any previous stories featuring the character, I’m glad I finally did. The book follows the titular character, a British, street savvy punk who has a rich history with voodoo and magick. To kick off this story, she is rescuing a group of kids from cannibal monsters deep in the bayou. With a bit of help from her magical entity sidekick Aye, she is able to take on the beasts and rescue the group. But not without consequences. Somehow, throughout the fight, Aye mysteriously disappears. With no clues or ideas as to what could have caused this, she is forced to seek help. This takes her on an adventure across the voodoo landscapes of New Orleans and beyond. With a little bit of help from legendary voodoo queen Marie Laveau, she is on a mission to find out what happened to Aye before it’s too late. From the very first panel, “Punk Mambo” #1 comes out of the gate swinging. It starts in the middle of a mystery that Punk is trying to solve, and that is what leads into the heart of the story. It’s a fantastic story device, one that gives you a solid idea what the story is, without giving away the real plot. As a reader, it was the ideal introduction to this world. Reading this without having previous experience with the character, I didn’t feel lost at all. It felt new and exciting to me, and that’s a great thing. The artwork alone is something to behold in this book. Done by artist Adam Gorham, it has a punk rock style all it’s own. The world is beautifully rendered, with incredibly detailed backgrounds, monsters, and human characters. The character designs of Punk and Marie Leaveu are exceptionally well done, I felt like there was a beating heart in them both. Everything blended so well together in this phenomenal world. The writing by Cullen Bunn adds another layer of greatness to an already fantastic book. The story is a lot of fun with some exciting bits throughout. The dialogue is great. I liked that every character in the story, depending on where they are from, has a different inflection and vocabulary. Without doing any research, I already knew that Punk was British. The world around her and the way others speak is different, and you can tell she is somewhat of an outsider. That is much to Bunn’s credit as a writer, and I thought it was incredibly well done. Punk Mambo is the voodoo infused mystery you never knew you needed. It’s a fantastic book with a fascinating lead and a great story. My interest in the supernatural, Voodoo and punk rock could very well make me a bit biased, but I would recommend this book to anyone. I’m hooked from the first issue, and I can’t wait to see what happens next. Previous The Joker Trailer Is Here!